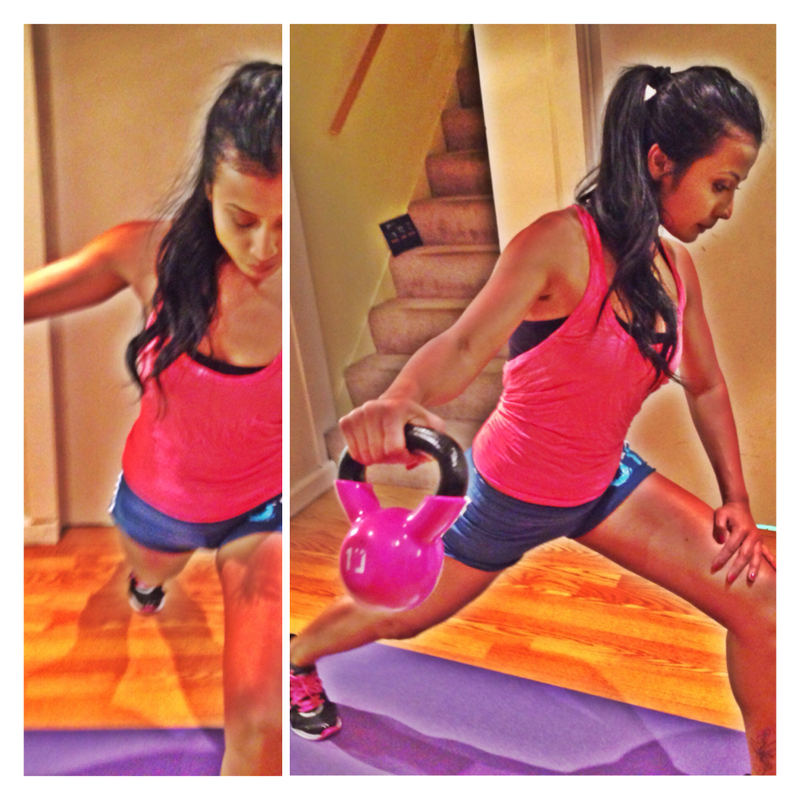 Lately, I have been quite liking the kettlebell workouts. Kettlebells are the trendiest thing in the world of fitness, after protein shakes. Now again you’d think, why kettlebell? why not dumbbells? And my answer to that will be it all depends on what you are trying to achieve. Kettlebells target a slightly different type of muscles group than the dumbbells. And there are certain type of exercises which can be performed better with the way the kettlebell is shaped vs a dumbbell. In the long run, the idea is to alternate between the two when you are working out, to get the maximum benefits. 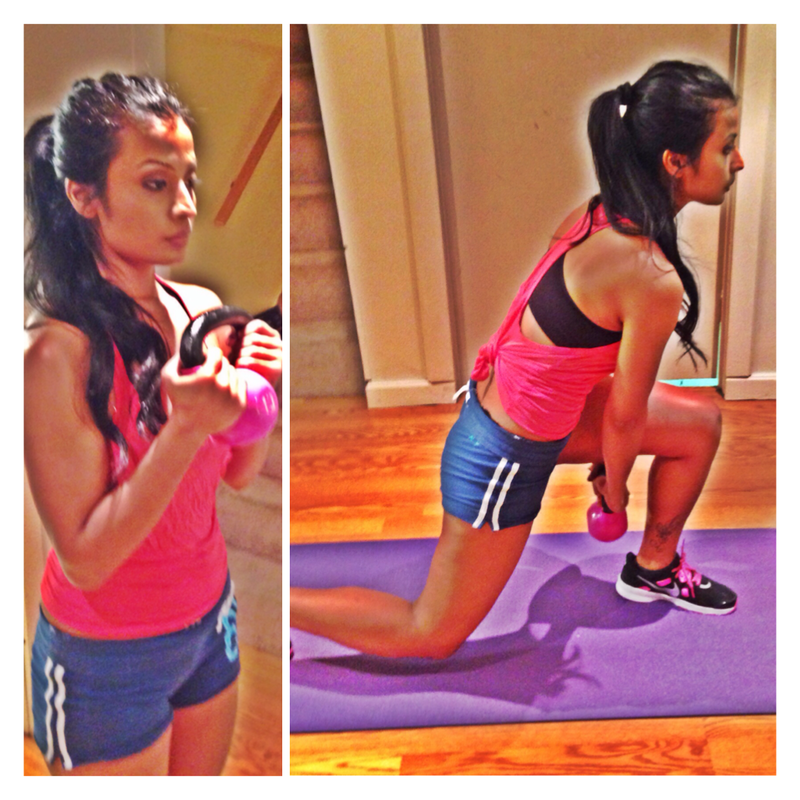 The exercises I have listed below can be performed using either a dumbbell or a kettlebell. In the pictures I am using a 10 pound kettlebell. Please feel free to use heavier weights to challenge yourself. Great upper and lower body workout. Targets the shoulders and the forearms, while working the thighs and the glutes. These are my absolutely favorite! They not only work the obliques, but also the midsection of your abs. You can either place your feet on the mat, or raise them for added challenge. This exercise incorporates the entire body in just one move. It works the arms, the legs and the abs all at the same time. Depending on your speed and the weights you are using, the entire workout should take you approx. 25 to 30 minutes to complete. Warning- Great amount of breathlessness and sweat will be experienced. Followed by fatigue and soreness if performed for the first time. Followed by firm muscles and lean body!